The vigorous, hardy weeds on New Zealand farms and forest plantations can be harmful in many ways – they poison animals, clog irrigation channels, and smother crops. One weed, giant buttercup, costs the dairy industry over $150 million each year in lost productivity and attempts at control. Weeds are plants growing where they are not wanted. On farms, plants are considered weeds if they grow among crops, in forest plantations, or on pasture where animals graze. Māori burned the land and grew crops on it for a short time, then let it become bush again. Invading plants like bracken did not have time to become a problem, and Māori had no word for ‘weed’. Crew on Captain James Cook’s second voyage to New Zealand, in the early 1770s, planted vegetables they had brought from England. Some of these, especially cabbages, turnips and radishes, spread throughout the country – so did the weeds that grew alongside them. Many weeds were accidentally brought to New Zealand by early settlers, for example as seeds in bedding, hay or straw. 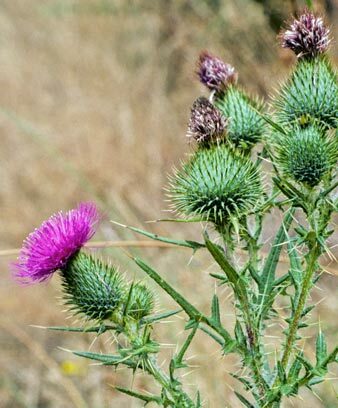 Some plants were brought because they were useful for cooking or as medicine, but became weeds when they escaped from gardens and smothered other plants. Gorse, one of New Zealand’s worst weeds, was originally brought from England for farm hedges. Some weeds that grow in pastures can harm grazing animals. Ragwort is poisonous, while thistle damages skin and eyes. Unwanted plants in fields and new forests affect the growth of grass, crops and trees by competing for nutrients and space. Water plants like alligator weed and hydrilla form dense clumps that clog drains, irrigation channels, and rivers. They grow where fertiliser from farmland has increased nutrients in the water. Farmers used to hoe or burn weeds. Chemical herbicides have been popular since the 1920s, although some early mixtures were dangerous. Today, herbicides such as Roundup can kill the leaves and roots of a number of weeds. Weeds cost New Zealand farmers billions of dollars each year in lost productivity.